There’s always a scene in any movie or television show depicting a surgical operation: a nurse or assistant clad in scrubs, enters the room pushing a cart. On the cart lies several delicate instruments, their hard steel glistening under the harsh lights of the theatre. None of the instruments touch each other, and they are placed in a carefully organized order. Then we see the scene after the operation: the once pristine instruments stained with the bright red of blood, and discarded into a bowl. They have fulfilled their purposes, the dangers embodied in their construction has diminished and they are to retire until they are called for again. I love those scenes. The instruments play as much of a role in surgical operations as the nurse, the lights, the antiseptics anesthetics and of course, the surgeon. But without the instruments there really is no operation. Without the instruments is a surgeon even a surgeon? The 10th century Arabic scholar and physician, Abu al-Quasim ibn al-Abbas al-Zahrawi (936-1013) introduced many notable surgical instruments in his eponymous Kitab al-Tasrif ( Method of Medicine), a thirty volume encyclopedia on the anatomy and practise of medicine. Al-Zahrawi, also known by his Latinized name Albucasis, details over 200 instruments, many of which he devised himself, combining ideas from ancient Greek and Roman physicians with his own observations and experiences as a surgeon. Al-Zahrawi stressed a skilled surgeon would not only know the uses and benefits of numerous types of instruments, but will apply the knowledge to make sure an instrument was used properly and carefully to prevent excessive pain to the patient. 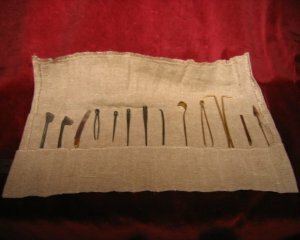 Other medieval surgeons also stressed the importance of instruments–the surgeon’s kit–as an essential part of the surgeon’s practice. Before the operating theatre had instruments nicely laid out on a cart, surgeons often carried their own instruments in a box or bag, taking with them as they attended to patients. Some were of simple designs, while others were more elaborate, with ivory, gold, or silver detailing. 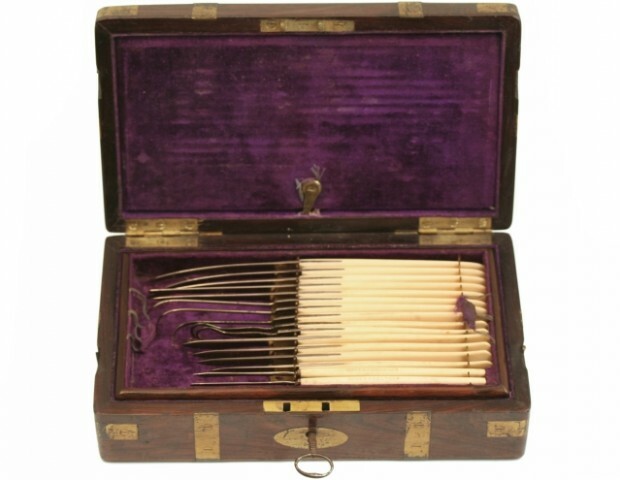 An ivory surgical presentation set, c.1868. 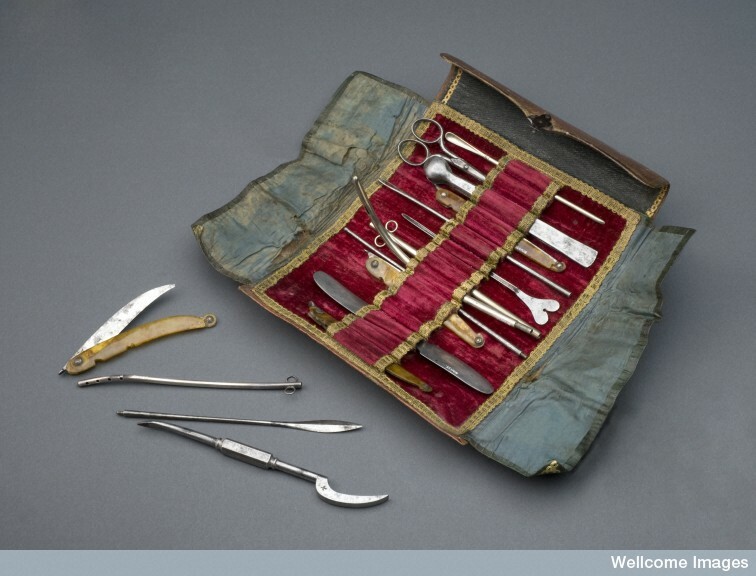 It contains a full complement of scalpels, bistouries, needle threaders and tenaculum hooks. The lid compartment contains two scissors, one pair of scissor handled and two hand forceps. The lower tray contains a crosshatched ivory metacarpal saw, a director, two silver tracheotomy tubes, a crosshatched ivory and silver trocar and a pair of bone forceps. 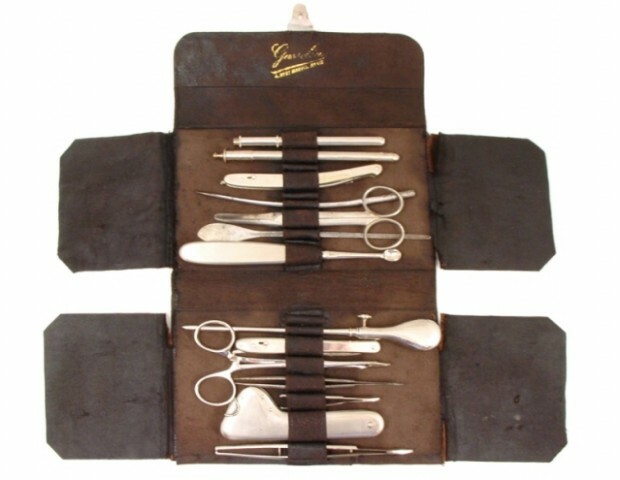 These kits consisted of knives, razors, and lancet for making incisions; cattery irons grasping tools, probes, suture scissors, saws, needles, cannulae, pads, bandages, and in some instances, even tools for trepanation. Some kits also contained analgesics such as opium or hashish as pain relievers, or plasters for treating wounds. Pre-anesthetic surgery was crude, gruesome, and horrifying. Operations were limited to amputations, suturing, and bone-setting. And because it was preferable patients remained awake during the operation (as it was easier to deduct whether there was serious danger), speed was a crucial factor for ensuring a higher degree of success. Instruments were used over and over, frequently without being cleaned, and without being disinfected–antiseptics wouldn’t arrive until the second half of the nineteenth century. 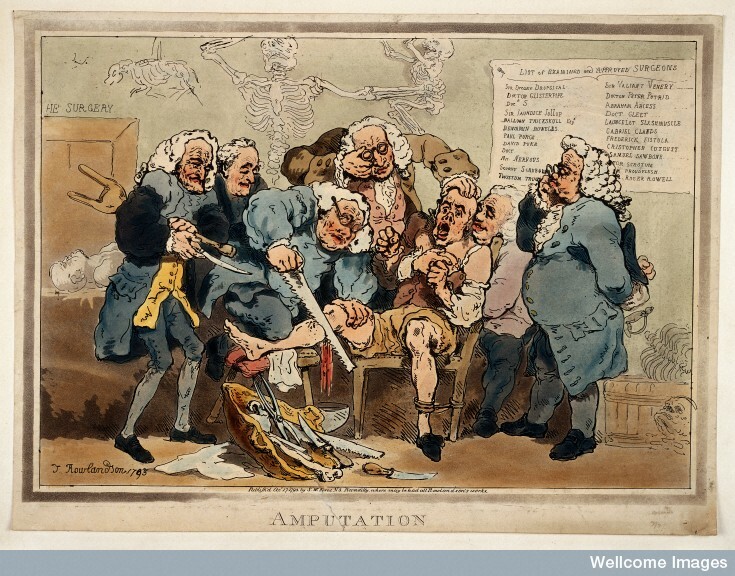 Five surgeons participating in the amputation of a man’s leg while another oversees them. Coloured Aquatint by Thomas Rowlandson, 1793. Rebuilding David Livingstone’s medical equipment used in Africa in 19th century. Looking primarily for a leather field surgeon’s kit. Thank you.